It’s been three years since I started coaching and mentoring Graduate Research Fellowship Program applicants through Rice University’s Center for Written, Oral, & Visual Communication. This year, I am thrilled to announce that several students with whom I worked have been recognized by the National Science Foundation! It’s been an honor to be a small part of their journeys. Congratulations to new GRFP Fellows Katie Brown (first year in Bioengineering), Constantinos Chamzas (first year in Robotics and Computer Vision), Gebhard Keny (second year in Cultural Anthropology), and Felix Wu (graduating Psychology undergraduate), and honorably mentioned students Izzy Bilotta (first year in Industrial/Organizational Psychology) and Hana Jaafari (second year in Biophysics)! 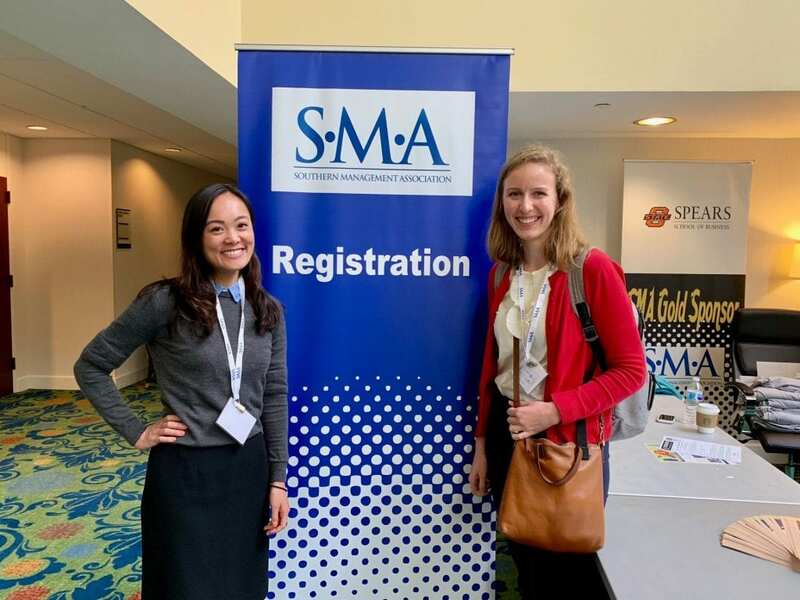 I recently returned from the Southern Management Association’s annual meeting, where I participated in a doctoral consortium. Alongside my labmate Allison Traylor, I was one of a few dozen graduate students who were selected and awarded a small stipend for this career development workshop. We packed our bags and headed to Allison’s home state of Kentucky. Throughout a day of sessions, faculty members provided insight into a successful academic career in management. SMA offered different levels of consortia, depending on your progress in the doctoral program. I participated in the “late stage” version as a fourth year student, while Allison, in her second year, attended the “early stage” one. We really enjoyed the sessions, particularly the “Ask the Editors” panel (and not just because they mentioned the strong work of Rice’s faculty and alumni). I recommend this to fellow grad students interested in business schools, and will be seeking out similar developmental opportunities in the future! 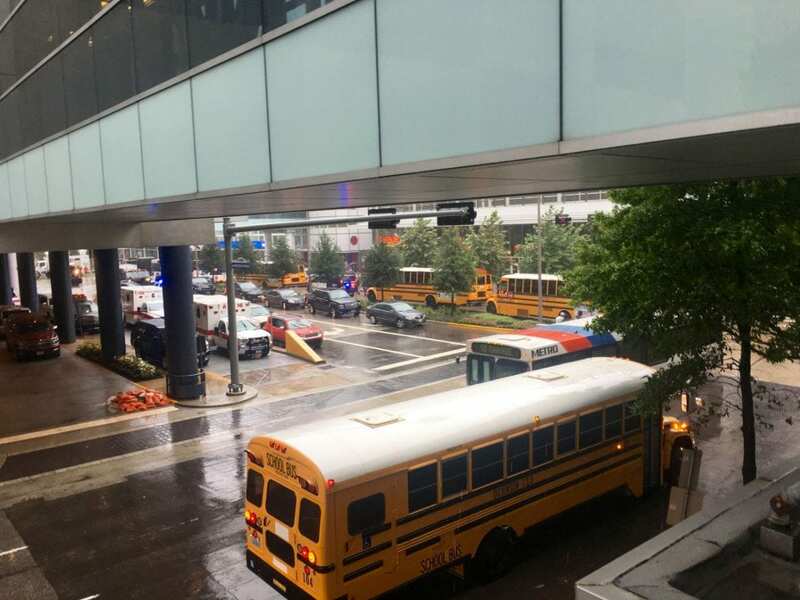 A view of George R. Brown Convention Center on the first full day following Harvey. On August 27, 2017, I found myself driving through the dark and flooded streets of Houston. My significant other and I were on our way to volunteer at an emergency shelter. Once we arrived, we became two of hundreds of people — not only those seeking refuge from Hurricane Harvey, but also fellow community members rushing in to help. It made me wonder how organizational psychology could assist volunteer efforts in times of need. A little more than a year later, these passing thoughts yielded a publication: a review of leadership practices that can help during crises. You can find “Steering Through the Storm” at People + Strategy, the professional journal of the Society for Human Resources Management’s Executive Network, HR People + Strategy. Rice News wrote a press release, which you can view at this link. This personal experience and professional work has sparked an interest in humanitarian research, particularly as it relates to crisis management and prosocial behavior. More to follow! Dinh, J. V., & Salas, E. (2018, October). Steering through the storm: Leading organizations during crisis. People + Strategy, 41(4), 22-27. As an NSF coach, one of the most frequently asked questions I received is, “How do I cite things?” Because there is no formal convention, students have a lot of leeway here. To this end, I always recommend using the most economic citation format — you want to maximize real estate for your actual statement writing. Below, I detail my method, which by no means is required or even necessarily recommended; you can and should explore options and norms in your field. This is just what worked for me. In-text citations: I personally used superscript numbers in the body of my statement. I assigned a number to each reference as it occurred in the statement, starting with 1,2,3, etc. ; if the same reference was cited later in the statement, I would label it with the same number that it had originally been given. Author(s)’s information: last name; first and middle initials. If there were more than six authors, I only included the first author’s information and added “et al” afterward. References: 1. Beach, M. C. et al. Med. Care (2005). 2. Smedley, A. R., Stith. A., & Nelson, A. R. (The National Academies Press, 2003). 3. Hebl, M. R. & Xu, J. J. Int. Assoc. Study Obes. (2001). 4. Paasche-Orlow, M. (2004). 5. Betancourt, J. R., Green, A. R., Carrillo, J. E. & Ananeh-Firempong, O. Public Health Rep. (2003). 6. Salas, E., Tannenbaum, S. I., Kraiger, K. & Smith-Jentsch, K. A. Psychol. Sci. Public Interest (2012). 7. Corbin, J. & Strauss, A. (SAGE Publications, Inc, 2007). 8. Bhandari, M. et al. Acad. Med. J. Assoc. Am. Med. Coll. (2003). 9. Olguín Olguín, D. (MIT, 2007). 10. King, H. B. et al. (Agency for Healthcare Research and Quality (US), 2008). 11. Weld, L. R. et al. Am. J. Med. Qual. (2015). An obvious note: This may also mean forgoing the normal reference style within the field. In my case, the American Psychological Association’s [APA] format would have taken up substantially more space than this strategy. It seems reviewers understand the name of the game! How does your work benefit society? How will your research improve society? Does it introduce new concepts, theories, or knowledge? Does it test new methods? How else can it push boundaries of what is currently known? How will you, on an individual level, contribute beyond your research? * This sometimes overlaps with intellectual merit, but you can also argue for a case here if appropriate. Of course, you want to be careful not to overstate the impact of your research. That’s why it’s helpful to not just focus on the “quality” of your experiences, but the “quantity” too: the many avenues through which you can affect change. It can thus be useful to triangulate your broader impacts, including through consideration of the above questions. 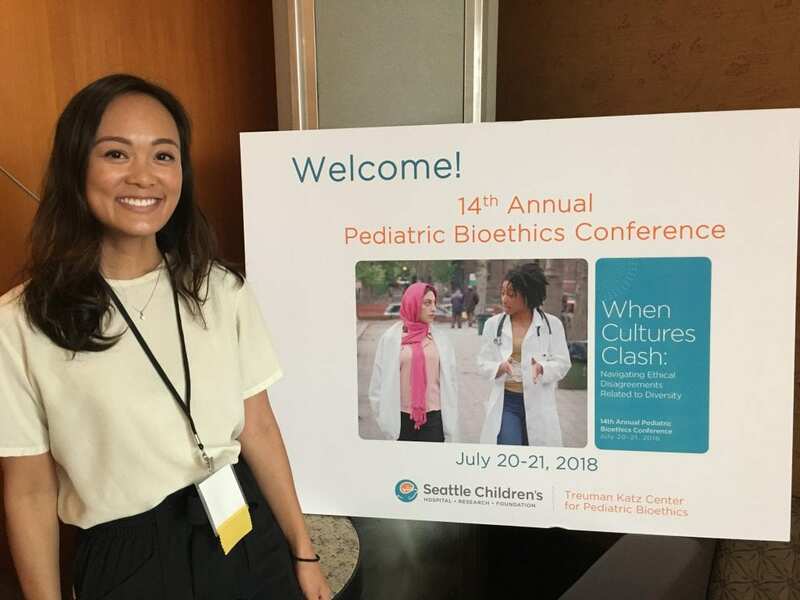 This July, I was honored to present my cultural competency research at the 14th Annual Pediatric Bioethics Conference, hosted by Seattle Children’s Hospital’s Treuman Katz Center for Pediatric Bioethics. I am no bioethicist, but one of my collaborators is an expert in the area and recommended that we submit something, particularly given this year’s theme: “When cultures clash: Navigating ethical disagreements related to diversity.” Indeed, our findings on cultural barriers during end-of-life decision-making fit nicely. The conference was absolutely delightful, and not only because it was in Seattle during its gorgeous summer. Highlights included: hearing Anne Fadiman‘s opening talk (and being listed opposite her in the program! ); attending an intimate speaker’s dinner and getting to know people in the field; and receiving high ratings on my presentation following the event. I can’t say enough good things about this meeting, and hope that I get the chance to return again soon. The annual SIOP conference is always fun — and this year, the most action-packed yet! Within 24 hours, I co-chaired three symposia, presenting a meta-analysis, a longitudinal quantitative study, and a qualitative project. I organized this symposium in the days immediately after Harvey had swept through my neighborhood — and with the submission deadline on the horizon. In short order, we assembled a collection of papers on preventive science, disaster recovery, and first responder teams. We also included expert insight from my esteemed co-chair Tracey Rizzuto, Ph.D., who experienced and conducted work around Hurricane Katrina. 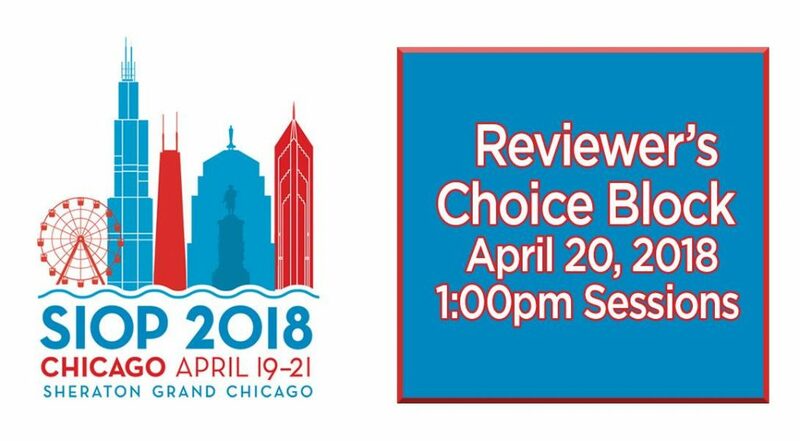 Together, our symposium earned the Reviewer’s Choice distinction, representing the 20 (2%) highest-rated sessions at SIOP. More valuable than the recognition, however, was the response from the field. It was heartening to see I/O colleagues interested in humanitarian efforts — using our knowledge for good. Since winning my NSF GRFP, I’ve been coaching fellow graduate students on grant-writing through Rice University’s Center for Written, Oral, & Visual Communication. This year, I worked closely with two students who just received fellowship offers! Congratulations to Allison Traylor (first year in Industrial/Organizational Psychology and fellow CORE member), and Josh Chen (first year in Bioengineering and fellow Cal alum [Go Bears!]). Last semester, two of the wonderful research assistants in my lab interviewed me for our lab blog. In honor of their conscientious investigative work, I am sharing it here. Thank you, Andrea and Lois, for such a thorough and well-written piece! Lois wrote an additional blog post on the connections between our research and Anne Fadiman’s seminal work, When the Spirit Catches You: and You Fall Down: A Hmong Child, Her American Doctors, and the Collision of Two Cultures. I actually came across this novel after beginning my work in cultural competency and only wish I’d read it sooner. Highly recommended! I am thrilled to share that I’ve been awarded a Small Grant Award from the Society for Industrial/Organizational Psychology (SIOP)! Over the next year, they will be funding a portion of my research on cultural competency in healthcare providers. This marks the first research grant for which I’m the principal investigator — and it’s a special honor being sponsored by my national professional society. Importantly, this work is a team effort, made possible by the incredible efforts of our group at Rice University and collaborators at Baylor College of Medicine, Texas Children’s Hospital, and Minerva Work Solutions. I’m fortunate to be in a position to do the work that moves me, and to be surrounded by people who support me in that process.